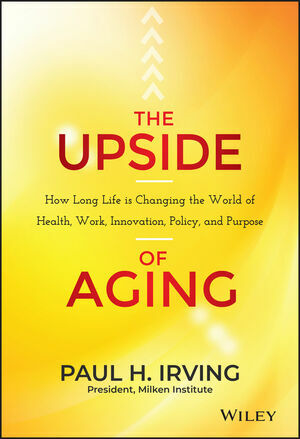 The Upside of Aging: How Long Life Is Changing the World of Health, Work, Innovation, Policy and Purpose explores a titanic shift that will alter every aspect of human existence, from the jobs we hold to the products we buy to the medical care we receive - an aging revolution underway across America and the world. Moving beyond the stereotypes of dependency and decline that have defined older age, The Upside of Aging reveals the vast opportunity and potential of this aging phenomenon, despite significant policy and societal challenges that must be addressed. The book’s chapter authors, all prominent thought-leaders, point to a reinvention and reimagination of our older years that have critical implications for people of all ages. The emotional intelligence and qualities of the aging brain that science is uncovering, “senior moments” notwithstanding. The new worlds of genomics, medicine and technology that are revolutionizing health care and wellness. The aging population’s massive impact on global markets, with enormous profit potential from an explosion in products and services geared toward mature consumers. New education paradigms to meet the needs and aspirations of older people, and to capitalize on their talents. The benefits that aging workers and entrepreneurs bring to companies, and the crucial role of older people in philanthropy and society. Tools and policies to facilitate financial security for longer and more purposeful lives. Infrastructure and housing changes to create livable cities for all ages, enabling “aging in place” and continuing civic contribution from millions of older adults. The opportunities and potential for intergenerational engagement and collaboration. The Upside of Aging defines a future that differs profoundly from the retirement dreams of our parents and grandparents, one that holds promise and power and bears the stamp of a generation that has changed every stage of life through which it has moved. Author of The Upside of Aging: How Long Life Is Changing the World of Health, Work, Innovation, Policy, and Purpose, a Wall Street Journal expert panelist and contributor to the Huffington Post, PBS Next Avenue and Forbes, Irving also serves as a director of East West Bancorp, Inc. and on advisory boards at USC, Stanford, and U.C. Berkeley, the Global Coalition on Aging, WorkingNation, and the Bipartisan Policy Center.